Nestled within the eastern slopes of the Cascade Mountain Range, Swiftwater Cellars is the setting of choice for an unforgettable celebration. Create lasting memories for you and your closest friends and family amidst the breathtaking views that surround you. Your event will be as beautiful as you imagined thanks to our venues’ rustic details, mountain elegance atmosphere, friendly staff, a selection of fine Swiftwater Cellar wines and an outstanding culinary experience. Our renowned chef has the expertise and flexibility to assist you in creating the ideal menu for you and your guests. Our luxurious, private and semi-private venues are suitable for groups as small as 10 and as large as 250. From start to finish, we take care of every detail to ensure your event is everything you could have imagined. For booking, please contact us. Meaning winery in Italian, this space is utilized at the peak of Harvest for grape crush. At the conclusion of harvest, this spaces transforms into the perfect Tuscan getaway. An authentic “cantina” is created with tall ceilings, exposed wood beams, stained concrete floors and Fresco-like painted walls. Large arching double doors open to both the northern patio and Garden Room. Named for the coal mine tailings, this space offers sweeping views of the Cascade Mountain Range. Its tranquil gardens overlook both the Tipple Hill and the Rope Rider Golf Course. This space is perfect for any outdoor event including wedding ceremonies, receptions and social parties. This beautiful space features lofted ceilings with exposed rafters, complete with large barn doors that open out to sweeping patios, bar-table fire pit and our landscaped amphitheater. Perfect for indoor ceremonies or receptions. Located at the heart of the winery, this is the largest space available at Swiftwater Cellars. Since it is a working winery at all times, this space is always embellished with stainless steel vats and other winery equipment. From the wood beam posts that accent the space to the ambient lighting that sets the mood, this space is ideal for those who enjoy the inner workings of a winery, but desire the ability to create intimacy. 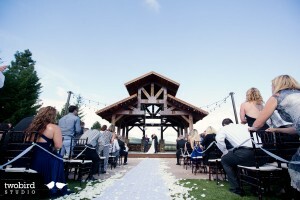 This scenic venue provides panoramic views of the Cascade Foothills. Our beautiful dining space is surrounded by floor-to-ceiling windows, ideal for corporate meetings, family gatherings or intimate rehearsal dinners. Enjoy the ambience of candle lit closeness, grand furnishings as if you’ve stepped into the cellars of an Italian villa. This exquisite space is accented with floor to ceiling custom-built wood cabinetry, wrought iron fixtures and a king’s table for dining.